Turkey, sweet potatoes, cranberry sauce, mashed potatoes, vegetables and pumpkin pie. Cabo San Lucas, Baja California Sur, CP 23450 Mexico. 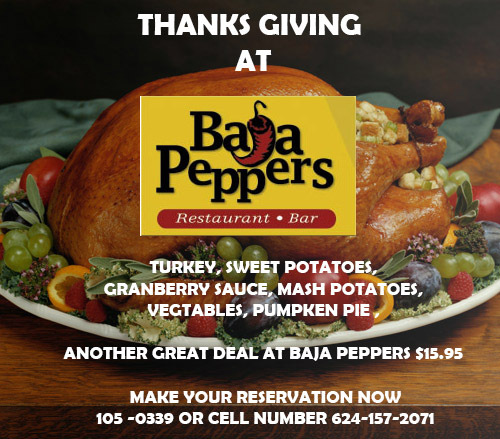 This entry was posted in Los Cabos Restaurants Events, Thanksgiving and tagged baja peppers, cabo, Cabo San Lucas, dinner, Los Cabos, restaurant, thanksgiving on November 8, 2013 by admin.